...Of course if your engineer says to replace it, then replace it. ..
Any plans on what column you're going to use? Barina columns have been done a few times (a good thread here) and there are some aftermarket options that look very nice, but are also quite expensive. I haven't discussed with my engineer if he's happy with the current column or not, but I'm considering the barina conversion, since it's probably safer, and my wife would like power steering. I will be using the Toyota Starlet column that came with my front cut. I will need to shorten the column (but still retain the collapsible structure) but I'm not concerned abut the lack of power steering. With the engine bay mechanicals all done, it was time to look to getting the driveshafts done. I've never actually seen anyone document how to measure the required lengths so this is what I came up with. I had the idea to use a section from an adjustable tent pole (or adjustable curtain rod could be used) for this task but then I need to replicate the shaft ends. 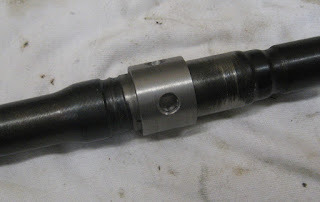 I machined some plastic pieces on the lathe to the same lengths of the splines at the end of the driveshafts. 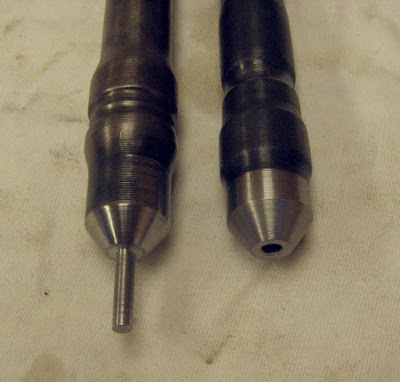 In the photo below, the top shaft is from the Mini - where a thick circlip limits how far the splined section can be inserted into the outer CV joint. The lower shaft is from the Toyota Starlet. With everything removed from the car, the required length was measured and the process repeated for the passenger side. Thanks to the 4AGE layshaft, these shafts ended up being near enough equal length - Driver side 270mm, Passengers side 290mm. If you have the funds available, I would highly suggest buying some Allspeed engineering HD CV joints. They have a bigger spline on the mini end and the ability to take way more horsepower. 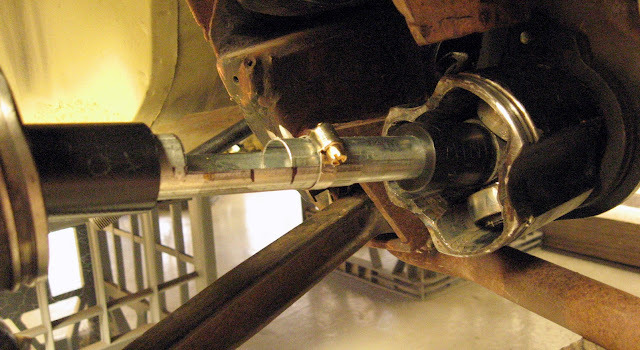 4efte engines are good at shagging driveshafts if you drive with a heavy foot and the boost wound up a little bit. I did consider those, however (potentially to my detriment?) I purchased some new Italian made outer CVs. I'll post some details when I get a photo of the final assembly but if it all goes bad later, I'll invest in those. Check those CVs you have too. Some of them have the drive flange spline incorrect and you cant get the correct pre-load on your bearings. I point this out because i had this issue happen. I got the CVs swapped eventually for a set that works.......but i later found out the inner race on some of them varies at the diameter where the shaft shoulder fits it. The fix was easy enough whatever it was- but it was inconvenient. I'm not concerned abut the lack of power steering. Where can i obtain said power steering for my car? In the weight lifting area of your local gym????? 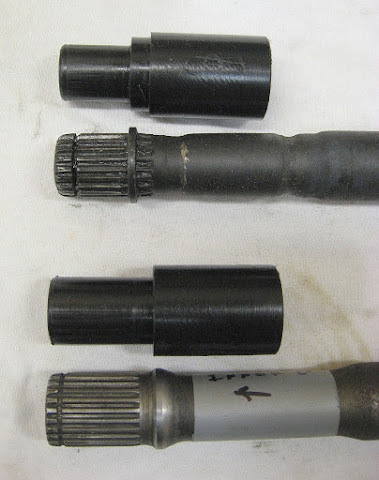 Short of paying about $800 for a pair of custom shafts, the other option was grafting the Mini & Toyota shafts together - a method I've seen in various engine swaps that provide a reliable solution, but I assume as long as the drivetrain is not abused. I cut the factory shafts and machined them to size in the lathe. The Mini shafts weren't too bad but the Starlet shafts were HARD. Even with carbide inserts on the lathe, I could only cut 0.1mm at a time so 4 hours later, I had two pieces for either side of the car. This pin arrangement kept everything aligned once they were lightly pressed together. I was planning on getting a pro welder to weld the shafts but after consulting with a workshop, we discussed the process they used and I could probably do it myself if I was confident enough with my welding (that's a yes). 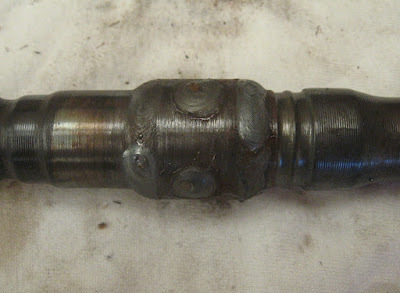 To give it the best chance of success, it was suggested to preheat the shafts to at least 250degC to minimise the temperature difference between the area being welded and the rest of the shaft base material, and this would help the entire shaft cool at a similar rate therefore helping to lessen shrinkage stresses that can lead to cracking and distortion. After welding was complete a SLOW cool would be required, NOT quenching. 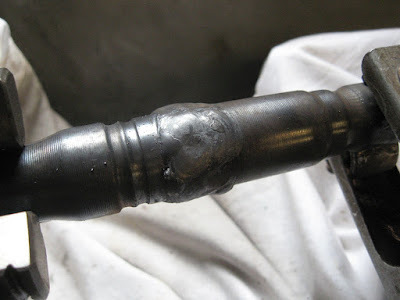 I tested/confirmed the correct settings on the MIG welder on the leftover shaft pieces and then with my pizza oven cranked to 300DegC the shafts were preheated and the V groove area filled with welds. I then made a custom 3mm thick sleeve to be welded on over the join area and also drilled some holes in the sleeve for plug welds. The reason the sleeve in the photo below is so short is that there is only about 40mm between the inner and outer CV boots, otherwise I'd have made it longer. After a quick paint job, I gave all the parts (with brand new outer CVs) to a workshop to assemble. Last edited by Mearcat on Fri Mar 15, 2019 8:08 pm, edited 1 time in total. I've only just noticed that in this pic of the assembled parts, the workshop has fitted the small end of the boots on the outer CVs at different positions on the shafts - The boot is stretched on one of assemblies (or compressed on the other). Will this affect the longevity of the boots? Last edited by Mearcat on Thu Mar 14, 2019 11:15 am, edited 1 time in total.